USparkle Therapy Centre & Day Spa offers great monthly specials. Check back regularly for our latest deal! Total Facial Skin Rejuvenation Package - SAVE $600! 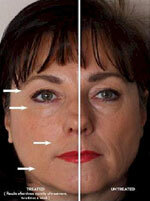 This is a luxurious 6-week course, targeting wrinkles, age spots and acne on the face, neck and chest. If you are looking for a pain-free, relaxing way to rejuvenate and revitalise your skin, then this is the treatment for you! Don't go through the pain and discomfort of face lifts and other uncomfortable facial procedures, this treatment is proven to tighten your skin and leave you looking years younger! Be quick, this special is only available for a limited time. But why pay that, when you can take advantage of this months great special! 1 x FREE Body Galvanic - This body galvanic treatment targets cellulite, mummy's tummies, batwing arms, wrinkles, age spots and other skin imperfections. 2 x FREE Makeup Consultations - Be sure the makeup you are using is safe and right for you and your skin type. Call us on 021 382 197 to book this treatment. Reflexology Foot Massage Packages - From $120! These are luxurious foot massages, aimed at reducing stress, pain and promoting relaxation. *Shellac Nails last for approximately 14 days, and with zero dry time, ten-minute removal time and no damage to your natural nail, you won't be disappointed. This is a luxurious Deluxe Neck & Face Galvanic Rejuvenation Luxury Treatment, targeting wrinkles, age spots and acne on the face and neck. This is a luxurious Deluxe Massage from Top to Toe Using Essential Oils. Relax and feel years younger with this luxurious massage.